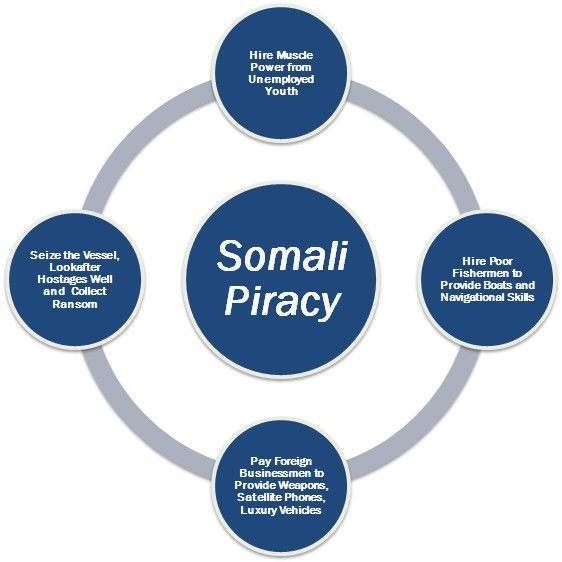 Piracy in Somalia is increasing. Why ??? Pirates involved in hijacking keep only 30 percent. Pirates’ bosses keep 20 percent. Government officials take 30 percent. Here is a pie chart showing the distribution. 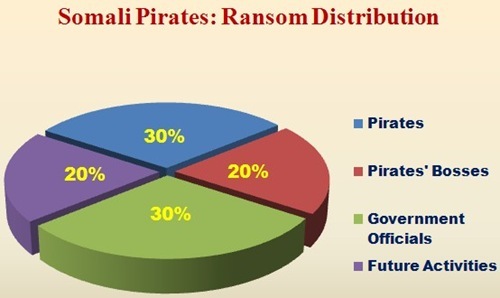 Pirates operating in waters off the Somali coast earned up to $150 million in ransom payments in 2008. Read more from RIA Novosti. Here is the new simplified formula for ransom distribution. The financier, usually a businessman who sponsors the piracy, gets 30% of ransom collected. The pirates directly involved in the piracy at sea, get 50% of ransom collected. The shore support team involved indirectly in the piracy, gets the remaining 20% of ransom collected.